One of the newest buzzwords floating around in the VC ecosystem and the financial services industry is “Fintech”. A word that means different things to different people. The old definition of fintech at its most minimalist was “service providers that sell technology products or services to financial services incumbents.” In a way this old definition described “financial technology”. This definition may have been valid up until the 2008-09 great recession. It is not anymore now and fintech is different than financial technology. Several vectors of change have contributed to meaningful change finally impacting the financial services industry which had been unit 2008-09 immune to such change, in great part due to the defensive moat of regulatory burden that actually protected financial services firms from competition and change in general. The 2008-09 great recession put all incumbents on the defensive. Massive losses will do that on the aggregate to any industry. Most banks, broker dealers, asset managers, and to a lesser extent insurers had to tend to tattered balance sheets and hits to their capital base. The regulatory backlash, driven by legislative scrutiny and fresh new laws aimed at reining in poor behavior, or the perception thereof, reinforced the defensive stance most if not all financial institutions found themselves in. No expansion, just retreat and “wound-licking” moves. In and of itself, the great recession would not have been enough to open the financial services to meaningful change. After all many capital markets crises, narrowly geographically focused or not, have happened in the past without causing much existential angst to the industry as a whole. Indeed, other factors, long secular factors, have been brewing for quite some time and are now being fully felt – factors external to the financial services industry. More startups are founded by pure hacker/developer/engineer types in more than just the core IT industry. The cost of creating and nurturing a startup has plummeted. Further, socio demographic factors are also at play. In industrialized countries new generations of consumers are coming online and they are consuming everything, financial services and products included, in drastically different ways than their parents and grandparents. In emerging countries, young generations are also coming online technology-wise (internet and smart device access) and online wealth-wise (GDP rise inducing mass affluent wealth rise). Do also realize that the financial services industry at large is suffering from a deficit of trust and brand awareness with newer generations which hinders all incumbents when trying to reach out to these new generations of consumers. Finally, the world is getting smaller and the rate of change we experience in our lives is accelerating. The financial services industry, being a truly global industry (especially from a b2b point of view, i.e. capital markets, reinsurance, correspondent banking, b2b payments, asset management to name but a few activities), is feeling the impacts of these two vectors twice over. Also, remember that centers of innovation and disruption have also blossomed across the world – think of London, Berlin, Singapore, Hong Kong, Shanghai, Sydney in no particular order). Now that I have laid out the vectors of change and their implications, we need to ask ourselves what does this mean for Fintech. Simply put this means there is a tremendous “once in a lifetime” paradigm shift happening. Fintech Startups and VC investors are now paying more attention to the industry and realize they can compete in ways they could not have in the past. Fintech startup service providers are finding it easy to compete with fintech service provider incumbents. Financial services incumbents are reeling under the assaults of startup competition, changing technology landscape, changing user/client/customer landscapes and technology companies encroaching on some of their businesses. Whereas fintech startups and fintech service provider startups are behaving like true technology companies, leveraging technology, data and user experience and doing more with less (the real promise of technology), service provider incumbents and financial services incumbents have no other choice but to also change to a new paradigm and behave more like technology companies. As such I come to the natural conclusion that Finserv = Fintech. Every participant in the financial services industry – new or old, small or large, startup, incumbent, service competitor – will have to be, if not already, a fintech participant. Incumbents will have to become fintech incumbents. Banks will have to become fintech banks. Note that for banks this means much more than being a digital bank or an API driven bank. This paradigm will apply to all five sectors of the industry: Lending, Capital Markets, Asset Management, Insurance and Payments. If you think that defining and qualifying Fintech was difficult, then think about quantifying the opportunity! First off, we know Fintech investments (VC mostly, and some PE) have mushroomed in the past 5 years, see below. It would not be reasonable to expect further geometric increases. The amount invested in fintech may stabilize or even dip for a year, especially when taking into account “normal” VC investments on a global scale as it would be difficult to foresee VC fintech investments being more than a reasonable % of total VC investments, see below. What I do expect is vigorous continued fintech investments for the next 10 to 15 years. Why? The answer lies with the importance of the financial services sector to world GDP, see below. These trillions represent the economic value of the financial services industry which in turn represents opex and capex across all work flows and processes and all business models. The opex and capex represent payroll, consulting gigs, auditing gigs, hardware and software purchases, sales and marketing budgets, overhead and economic value add. All of that is “in play”. All of it will go through the harsh filter of technology change, Fintech change. And as it always happens the resulting industry will do more with less. Hence, expect winners and losers and a share of GDP that will decrease over time. Further, give the massive $ amounts at play, the relatively slow sales cycles of any entreprise business models and relatively slow consumer behavior changes, the change will take place over time, which explains my 10-15 year horizon. Another way to look at Fintech is to focus on IT spending alone. 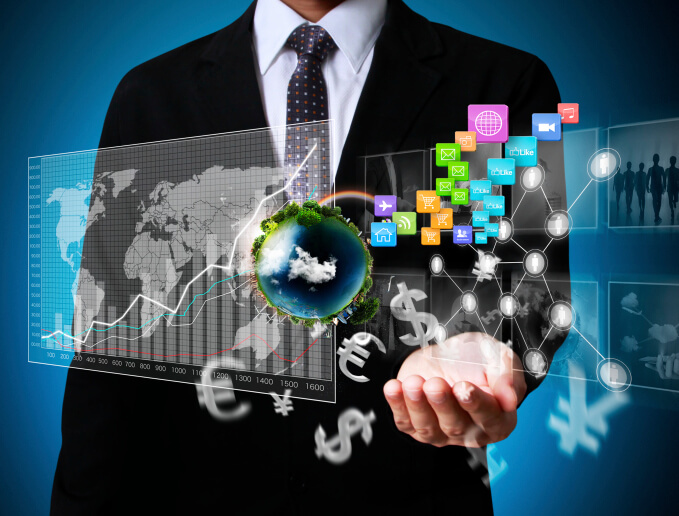 Gartner expects worldwide IT spending in the financial services to reach $486 billion in 2015. Quite a heady $ amount. Ovum, another IT research firm expects wholesale financial services IT spending to reach over $100 billion in 2019 – excluding anything that is retail based. Celent, yet another research firm forecasts bank IT spending across North America, Europe and APAC to reach $196 billion (wholesale and retail but purely banking). Obviously the numbers are sizable any which way you look at it. To make matters even more interesting as far as sizing future Fintech investments, most of the financial services industry IT spends are, sadly, focused on maintaining and keeping alive obsolete legacy systems. Remember, Finserv = Fintech, all participants will have to be Fintech participants and do more with less, focusing on technology, data and user experience. This means a) much of the current cost structure will be replaced, b) many of the revenue streams will come under intense pressure from companies from other industries and from fintech startups – indeed McKinsey in its latest Global Banking Annual Review for 2015 has forecasted that up to 60% of retail banks revenue streams may vanish and be “acquired” by startups and other non bank competitors. Let’s peg annual VC investments in Fintech at $10 billion annually. This would be a mere 2% of total IT spend in financial services forecasted by Gartner. Granted that the Gartner forecast will decay over time as new technology replaces obsolete ones, and as startups and large tech companies encroach even more on fintech incumbents revenue streams. Still there is a lot of room for Fintech to thrive going forward. Let’s peg global VC investments at $50 billion per year and our $10 billion Fintech straw man may seem too high. Can we really expect VC Fintech investments to be 20% of total VC investments every year? Maybe not. Yet, some believe we have entered a different era in VC land and that past data points may not be indicative of future investment trends. I remain skeptical. Donning my conservative hat, let’s assume VC Fintech investments will normalize at $5 billion, then the % looks more reasonable in relation to total VC investments. Finally, taking another look at financial services as % of global GDP, the added assaults of tech companies competition, fintech startups competition, transformation of all incumbents into fintech incumbents, it would not be unfathomable to expect a decrease from the current mid teens to low teens or even the 10% mark. Let’s assume low teen amount of 12%, which would mean a 4 percentage point decrease from 2014, equivalent to approximately $5 trillion. Granted speculation and capital markets play a large part in inflated numbers in any given year. Still, we have seen other industries transformed by technology and seeing their GDP contribution reduced swiftly and materially. Let’s assume a $5 trillion “savings” and use our annual $5 billion VC Fintech investments. I am cognizant that we’re not necessarily comparing apples and oranges, but as an order of magnitude, it helps putting in context and supporting annual VC investments in that ballpark. Anyway, I analyze the trends – technology, investment, socio demographics – and the numbers, I conclude that the Fintech opportunity has a very rosy future ahead. This is a guest post by Pascal Bouvier, an Investor & Fintech Expert. You can follow up with him via Twitter, LinkedIn and his blog, Finiculture.